Recently, a patient told me she just had her 50th birthday and was dismayed. She wasn't dismayed because she was 50, but rather that she was "sick and tired" of looking "sick and tired," when actually, she felt great. Sick and Tired of Looking Sick and Tired? Recently, a patient told me she just had her 50th birthday and was dismayed. She wasn't dismayed because she was 50, but rather that she was "sick and tired" of looking "sick and tired," when actually, she felt great. One of the hardest things about aging is feeling like your insides don't match your outsides. Part of what she was seeing was the physical change that is described as "looking haggard." Think of the hardy pioneer women in the old photos, who have been living a harsh existence in a sod house on the wind-swept prairie for years, doing the washing, by hand, with an old metal washboard and lye soap. Gaunt, bone-tired and worn-out. That's "haggard." The “haggard” physical appearance is characterized by multi-layer volume loss affecting the skin, subcutaneous fat, muscle and underlying bony support. It's caused in large part by a combination of simple aging, sun damage, chronic stress, weight fluctuations, and by the hormonal changes of aging (estrogen, testosterone, growth hormone etc.) that affect fat distribution, muscle mass and bone density. The result is a longer, more rectangular, flatter face with hollows under the eyes, flattened cheeks, and sunken-in mouth, temples, and jowls. There is less volume filling the facial structure, and the lost elasticity means that the skin doesn’t retract over the changed shape. So not only are the shape and contours of the face changed, the skin sags too. Usually you start to see the very first signs of these changes in mid-late thirties or early forties as a very slight hollowing under the eyes and a softening of the jawline. Yep, you do. It may be seen earlier in endurance athletes such as runners as the so-called "runners face." When you look at a youthful face, it is widest at the cheekbones, giving the "triangle of youth." 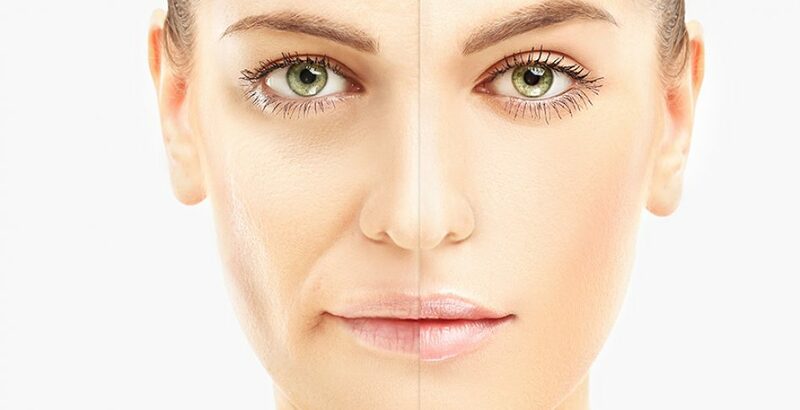 With aging, fat, bone and muscle are lost in the temples, cheekbones, jawline, and around the mouth allowing the remaining skin and tissue to droop. This turns the "triangle of youth" into the "pyramid of age." Since most of us aren’t living in a sod house on the prairie, and the only washboard we want to see is our abs, what’s a person going to do? Surgery (face lift, eyelid lift, neck lift) can remove some of the excess skin that results when there is not enough volume to fill it out. The resultant “tighter” appearance helps with the sagging, but doesn’t fix the volume loss. Because the skin is removed at the lateral (outside) margins of the face and upper neck, and the residual skin is pulled towards the ears and side of the face, it can cause a change in the contours and compartments of the face. This can lead to the dreaded “wind-tunnel” pulled appearance or the “Nike swoosh” where the lower margin of the apple of the cheek doesn’t angle down towards the jawline but swooshes out towards the ear. If done well, in the right candidate, a facelift can look natural and can really help “tighten the envelope” but it doesn’t fill the envelope. Non-invasive procedures such as Thermage or Ultherapy act to tighten existing collagen and elastic fibers and stimulate the formation of new collagen. It can tighten the envelope if the sagging is mild to moderate. Results do vary by patient, and work best if there is a reasonable amount of collagen present for the procedure to act upon. Results can be improved by combining these non-invasive skin-tightening procedures with the collagen stimulating injectable Sculptra, giving the energy additional collagen to work on. Targeted volume replacement with hyaluronic fillers such as Juvederm Voluma or Restylane Lyft can fill in specific areas that have lost volume such as the apple of the cheek, the area of the jawline in front of and behind the jowls, and to some extent, the temples. The advantage is immediate improvement, which can last up to 2 years. The only FDA approved product in its class, Sculptra Aesthetic (Poly-L-Lactic-Acid or PLLA) is a facial injectable given over larger surface areas than other facial fillers to stimulate your own body’s collagen production, replacing lost collagen. This gives an overall improvement in shallow to deep facial wrinkles and folds that appear with aging, restores volume, resulting in firming and lifting sagging skin and improved facial contour. This is a long-term anti-aging strategy; Sculptra is not a quick fix for an upcoming social event. Juvederm and Restylane are a better option for that. Sculptra treatment is completed over several treatment sessions, and over a larger surface area than other dermal fillers. Sculptra is injected over a broader area including the temples and upper cheeks as well as the jawline. Because it helps your skin make its own collagen, Sculptra restores the youthful oval shape to the face that results in lifting of the eyebrow, cheeks, corners of the mouth and jawline. That is why Sculptra injections are sometimes called "Liquid Lift" or "Liquid Facelift." The goal is overall improvement, rather than improvement targeted to a specific wrinkle. Improvement occurs gradually over 6 months and last for at least 2 years, or longer. Sculptra stimulates your body to make its own collagen, restoring youthful fullness to the upper face and tightening the looseness in the lower face. It gives natural looking improvement, increasing over time. Sculptra can also be used to help the crinkly, crêpey skin of the neck, upper chest and inner arms. Results are a natural, healthy looking improvement in appearance that is durable and gradually increases over time. And because your skin is actively making new collagen, results with other procedures, such as Thermage skin tightening, are enhanced as well. Cosmetic Dermatologists have multiple non-invasive treatments to help you look vibrant, relaxed, healthy, and most importantly, natural. So when you look in a mirror, what you see on the outside matches how you feel on the inside.